The Arctic Oscillation is a climate pattern that influences winter weather in the Northern Hemisphere. It is defined by the pressure difference between air at mid-latitudes (around 45 degrees North, about the latitude of Montreal, Canada or Bordeaux, France) and air over the Arctic. A low-pressure air mass usually dominates the Arctic, and while higher pressure air sits over the mid-latitudes. This pressure difference generates winds that confine extremely cold air to the Arctic. Sometimes, the pressure systems weaken, decreasing the pressure difference between the Arctic and midlatitudes and allowing chilly Arctic air to slide south while warmer air creeps north. A weaker-than-normal Arctic Oscillation is said to be negative. When the pressure systems are strong, the Arctic Oscillation is positive. Throughout December 2009, the North Atlantic Oscillation was strongly negative, said the National Weather Service. 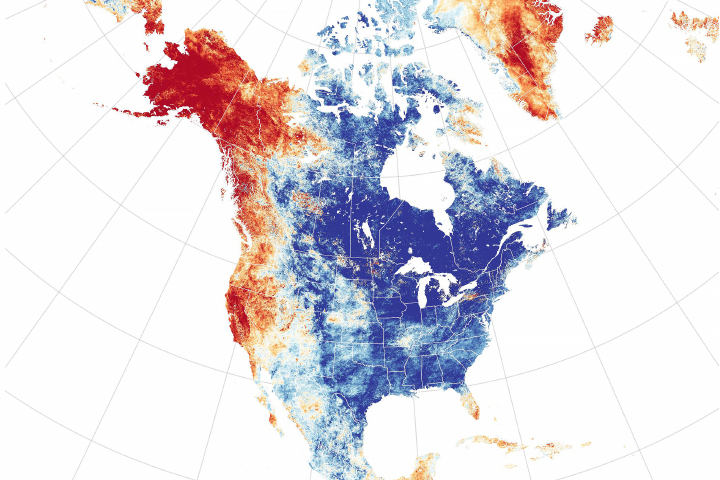 This image shows the impact of the negative Arctic Oscillation on land surface temperatures throughout the Northern Hemisphere as observed by the Moderate Resolution Imaging Spectroradiometer (MODIS) on NASA’s Terra satellite. Cold Arctic air chilled the land surface at midlatitudes, while Arctic land, such as Greenland and Alaska, was much warmer than usual. 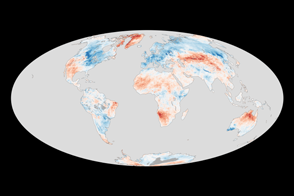 NASA Earth Observatory image by Kevin Ward, based on data provided by the NASA Earth Observations (NEO) Project. Caption by Holli Riebeek. 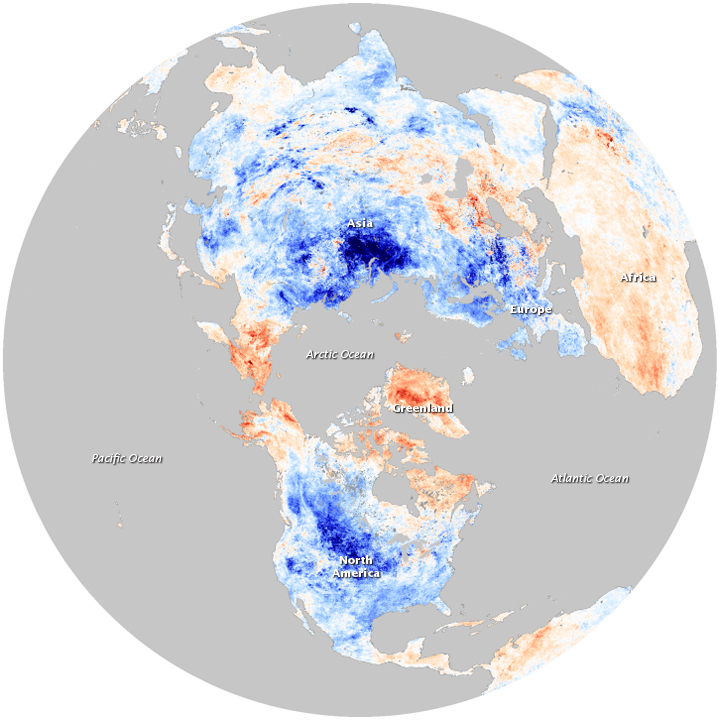 Much of the Northern Hemisphere experienced cold land surface temperatures in December 2009, but the Arctic was exceptionally warm. Climate Prediction Center. (2010, January 8). Arctic Oscillation. National Weather Service, National Oceanic and Atmospheric Administration. Accessed January 8, 2010. National Snow and Ice Data Center. The Arctic Oscillation. Accessed January 8, 2010. Wallace, J.M. (2000, July 17). On the Arctic and Antarctic Oscillations. University of Washington. Accessed January 8, 2010. National Snow and Ice Data Center. (2010, January 5). Extreme negative phase of the Arctic Oscillation yields a warm Arctic. Accessed January 8, 2010.